The 32-plus island nations of the Caribbean conjure images of white sand beaches, swaying palms and usually little else. But look closer and you’ll soon discover that the West Indies is a diverse region that suits not only honeymooners looking to fly and flop in paradise, but those seeking adventure, culture, inspiring cuisine and spas. Of course it particularly excels in areas like diving, sailing and watersports. Accommodation comes in many forms including boutique, feet-in-the-sand boltholes, charming B&Bs, dive lodges, all-inclusive, private villas, sophisticated five-star resorts and high end private island retreats. I would say all are well versed in making honeymooners feel special – but make sure they know it’s your honeymoon in advance – and many have a sophisticated set up when it comes to weddings with co-ordinators on-hand to tailor-make your big day. The key to getting your Caribbean wedding and honeymoon right is to choose the right island and the right resort for you. 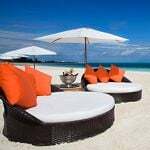 So you need to do some research such as speaking to a Caribbean specialist like Caribtours which has a wealth of advice on romantic places to stay, or Essential Detail which has picked 13 of the best small hotels and resorts in the Caribbean. Tourist board websites can also be very helpful but remember if you call a tourist board, they will obviously promote their own island and not give you an overview. The Caribbean Tourism Organisation can be useful for this. So which is the right island for you? St Lucia is an island that many feel has it all. Unusually, its geography differs greatly from north to south, so much so that it’s possible to have a two-centre honeymoon on one island. The south is home to the majestic Pitons, lush rainforest, botanical gardens, a walk-in volcano, zip lines and mountain biking trails, plus very individual resorts like Anse Chastanet and Jade Mountain. The north is more densely inhabited with more hotels, restaurants and bars around busy areas like Rodney Bay and its attractive Marina. St Lucia is a good choice for weddings, heritage, eating out and spas. If you want a cosy boutique resort with an upmarket all-inclusive package, go to East Winds. It has just 30 suites, and also offers weddings. 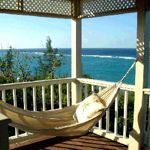 Jamaica is perhaps the most popular of all Caribbean islands, but often dismissed as somewhere that is spoilt or too mainstream, or even dangerous. In fact, it is a fabulously diverse island with long established five-star resorts like Half Moon Bay and Jamaica Inn, as well as funky hideaways like Strawberry Hills in the Blue Mountains. Anguilla is one of those tiny Caribbean islands that is a total escape from everyday life. It’s tiny with some of the most incredible white sand beaches in the world and a surprisingly happening food and party scene, perfect for chilling out and indulging. Top honeymoon resorts include Cap Juluca and CuisinArt Golf Resort & Spa. If you have a healthy budget, the Caribbean is home to some exceptional private island resorts including Mustique in the Grenadines and Necker Island in the British Virgin Islands. Here honeymooners are treated like royalty. Barbados remains one of the most popular islands for UK couples due to its very distinct island feel and good choice of hotels including some very individual hideaways such as The Atlantis and Little Good Harbour. If you want an adults-only all-inclusive head down to Sandals Barbados. An alternative to busy islands and big resorts, check out St Kitts which has an “old school” vibe of plantation architecture, warm hospitality and toes-in-the-sand casual bars and restaurants. 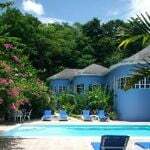 Best places to stay include Ottley’s Plantation Inn which has manicured gardens and a lovely spa overlooking the rainforest. Grenada is another Caribbean gem with much local colour and a sense of Caribbean yesteryear. Check out the newly-reopened Sandals LaSource Grenada Resort & Spa which has an emphasis on spa and well-being. In the current climate, your honeymoon budget may be squeezed or you might just be looking for exceptional value for money. All-inclusives are often a good solution. They may not be a budget option, but you certainly get a lot for your money and there are no extras to worry about on check out. 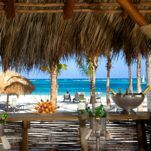 Secrets Royal Beach Punta Cana in the Dominican Republic is a great choice, as are Sandals Resorts such as Sandals Emerald Bay, Great Exuma, Bahamas and the St Lucian Spa & Beach Resort. 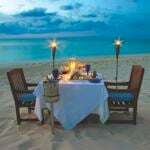 * Now check out our detailed guide to the cost of a honeymoon in the Caribbean. Find more all-inclusive honeymoons in the Caribbean. Visit our sister site, 101 Holidays, to find the best time to visit the Caribbean. Are you short of cash or time? Find honeymoons on a budget and mini moons. Also see my guide to the best honeymoon destinations in the Indian Ocean, and in the Mediterranean. How Much Does a Honeymoon in the Caribbean Cost?